Our staff at Medifocus is committed to keeping our subscribers to the Medifocus Digest Alert on Atrial Fibrillation abreast of the latest new research developments that have recently been published in the medical literature for this condition. In this issue of the Digest Alert, you will find a focused list of hand-picked journal article references that represent the latest advances in basic and clinical research for Atrial Fibrillation. 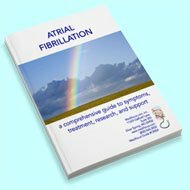 These articles represent the current state-of-the-art of the research that will hopefully lead to additional major advances and breakthroughs in the clinical management of Atrial Fibrillation. You can access the summaries of each article referenced below by simply clicking on the article Title. We will continue to update you with the latest scientific and clinical developments through the Medifocus Digest Alert on Atrial Fibrillation every 3 months. Thank you for your ongoing subscription to this publication. 1: Atrial fibrillation in athletes and general population: A systematic review and meta-analysis. Institution: Center of Morphological Experiment, Medical College of Yanbian University. Province, China. Journal: Medicine (Baltimore). 2018 Dec;97(49):e13405. doi: 10.1097/MD.0000000000013405. 2: Patients with Atrial Fibrillation and Chronic Kidney Disease More Often Undergo Angioplasty of Left Main Coronary Artery - a 867 Patient Study. Institution: Department of Cardiology, Medical University in Bialystok, Bialystok, Polanda.tomaszuk@poczta.fm. University, Warsaw, Poland. Poland. Poland. Poland. Journal: Kidney Blood Press Res. 2018;43(6):1796-1805. doi: 10.1159/000495637. Epub 2018 Nov 30. 3: Perceptions and experiences of MediYoga among patients with paroxysmal atrial fibrillation-An interview study. Institution: Karolinska Institutet, Department of Clinical Sciences, Department of Cardiology, Danderyd Hospital, 182 88 Stockholm, Sweden; Sophiahemmet University, Lindstedtsvagen 8, 114 28 Stockholm, Sweden. Electronic address: maria.wahlstrom@shh.se. Danderyd Hospital, 182 88 Stockholm, Sweden; Ersta Skondal Bracke University College, Box 111 89, 100 61 Stockholm, Sweden. Cross University College, Box 1059, SE 141 21 Huddinge, Sweden. Journal: Complement Ther Med. 2018 Dec;41:29-34. doi: 10.1016/j.ctim.2018.09.002. Epub 2018 Sep 5. 4: Is it safe to stop oral anticoagulation after catheter ablation for atrial fibrillation? Institution: a Department of Cardiology , Montefiore Medical Center, Albert Einstein College of Medicine , Bronx , NY , USA. Journal: Expert Rev Cardiovasc Ther. 2019 Jan;17(1):31-41. doi: 10.1080/14779072.2019.1550718. Epub 2018 Dec 18. 5: Optimizing Stroke and Bleeding Risk Assessment in Patients with Atrial Fibrillation: A Balance of Evidence, Practicality and Precision. Institution: Istituto di Ricerche Farmacologiche "Mario Negri" IRCCS, Milan, Italy. Rome, Rome, Italy. Serbia. Serbia. Journal: Thromb Haemost. 2018 Dec;118(12):2014-2017. doi: 10.1055/s-0038-1676074. Epub 2018 Nov 20. 6: Treatment Persistence in Atrial Fibrillation: The Next Major Hurdle. Institution: Department of Internal Medicine, Boston University, Boston, Massachusetts, United States. Journal: Thromb Haemost. 2018 Dec;118(12):2018-2019. doi: 10.1055/s-0038-1676101. Epub 2018 Nov 19. 7: Atrial Fibrillation and Heart Failure in Women. Institution: Department of Medicine, Cardiology Division, Rush University Medical Center, 1653 West Congress Parkway, Chicago, IL 60612, USA. of California, Irvine, 520 Superior Avenue, Newport Beach, CA 92663, USA. 75 Francis Street Towers 3a, Boston, MA 02115, USA. University Medical Center, 1750 W. Harrison, Suite 1000, Chicago, IL 60612, USA. W. Harrison Street, Room 1159, Chicago, IL 60612, USA. Electronic address: Annabelle_Volgman@rush.edu. Journal: Heart Fail Clin. 2019 Jan;15(1):55-64. doi: 10.1016/j.hfc.2018.08.006. Epub 2018 Oct 24. 8: Comparison of dabigatran and warfarin used in patients with non-valvular atrial fibrillation: Meta-analysis of random control trial. Institution: Arrhythmia Center, Ningbo First Hospital, Ningbo, Zhejiang, China. Journal: Medicine (Baltimore). 2018 Nov;97(46):e12841. doi: 10.1097/MD.0000000000012841. 9: Risk Factors for Hemorrhagic and Cardioembolic Complications of Intracerebral Hemorrhage Associated with Anticoagulants. Institution: Department of Neurosurgery, Maebashi Red Cross Hospital, Maebashi, Gunma, Japan. Electronic address: m1620004@gunma-u.ac.jp. Maebashi, Gunma, Japan. Electronic address: t-arrow@f8.dion.ne.jp. Electronic address: tadashige07032000@yahoo.co.jp. Electronic address: ryosukeshintoku@yahoo.co.jp. Electronic address: h-fujimaki@maebashi.jrc.or.jp. Electronic address: k-asakura@maebashi.jrc.or.jp. Journal: J Stroke Cerebrovasc Dis. 2019 Feb;28(2):325-329. doi: 10.1016/j.jstrokecerebrovasdis.2018.09.054. Epub 2018 Nov 8. 10: Clinical characteristics and thromboembolic risk of atrial fibrillation patients with and without congestive heart failure. Results from the CRATF study. Institution: 1st Chair and Department of Cardiology, Medical University of Warsaw. Journal: Medicine (Baltimore). 2018 Nov;97(45):e13074. doi: 10.1097/MD.0000000000013074. 11: Reduced Doses of Direct Oral Anticoagulants in Ischemic Stroke Patients with Nonvalvular Atrial Fibrillation. Institution: Department of Neurology, Saitama Medical University International Medical Center, Saitama, Japan. Electronic address: ideguchi@saitama-med.ac.jp. Saitama, Japan. Journal: J Stroke Cerebrovasc Dis. 2019 Feb;28(2):354-359. doi: 10.1016/j.jstrokecerebrovasdis.2018.10.005. Epub 2018 Nov 3. 12: Predicting Thromboembolic and Bleeding Event Risk in Patients with Non-Valvular Atrial Fibrillation: A Systematic Review. Institution: Department of Medicine, Duke University School of Medicine, Durham, North Carolina, United States. ; Department of Orthopedic Surgery, Duke University School of Medicine, Durham, North Carolina, United States. ; Livongo, Mountain View, California, United States. ; Evidence-Based Practice Center, Duke Clinical Research Institute, Duke University School of Medicine, Durham, North Carolina, United States. ; Division of Cardiology, Duke University School of Medicine, Durham, North Carolina. Journal: Thromb Haemost. 2018 Dec;118(12):2171-2187. doi: 10.1055/s-0038-1675400. Epub 2018 Oct 30. 13: Patient Satisfaction with Direct Oral Anticoagulants and Warfarin. Institution: Division of Cardiology, Nihon University Itabashi Hospital. Journal: Int Heart J. 2018 Nov 28;59(6):1266-1274. doi: 10.1536/ihj.17-649. Epub 2018 Oct 25. 14: Management of atrial fibrillation: easy as ABC. Institution: Institute of Cardiovascular Sciences, University of Birmingham, Birmingham, UK. gregory.lip@liverpool.ac.uk. Liverpool Heart and Chest Hospital, Liverpool, UK. University, Aalborg, Denmark. Journal: Minerva Med. 2019 Feb;110(1):27-34. doi: 10.23736/S0026-4806.18.05824-X. Epub 2018 Oct 11. 15: Outcomes of anticoagulated patients with atrial fibrillation treated with or without antiplatelet therapy - A pooled analysis from the PREFER in AF and PREFER in AF PROLONGATON registries. Institution: Department of Cardiovascular Sciences, Campus Bio-Medico University of Rome, Italy. Electronic address: g.patti@unicampus.it. ; Medical Faculty Pilsen of Charles University, Czech Republic. ; Daiichi Sankyo Europe, Munich, Germany. ; 3rd Department of Medicine, Cardiology and Intensive Care Medicine, Wilhelminenhospital, Vienna, Austria; Sigmund Freud University, Medical School, Vienna, Austria. ; G. d'Annunzio University, Chieti, Italy. Journal: Int J Cardiol. 2018 Nov 1;270:160-166. doi: 10.1016/j.ijcard.2018.06.098. Epub 2018 Jun 28. 16: Mortality in heart failure with atrial fibrillation: Role of digoxin and diuretics. Institution: Institut de Recerca en Atencio Primaria Jordi Gol, Barcelona, Spain. Salut, Barcelona, Spain. Medicina Preventiva, Universitat Autonoma de Barcelona, Bellaterra, Spain. Barcelona, Spain. Salut, Barcelona, Spain. Bellaterra, Spain. Universitat Autonoma de Barcelona, Barcelona, Spain. Journal: Eur J Clin Invest. 2018 Nov;48(11):e13014. doi: 10.1111/eci.13014. Epub 2018 Aug 23. 17: Early therapeutic persistence on dabigatran versus warfarin therapy in patients with atrial fibrillation: results from the Outcomes Registry for Better Informed Treatment of Atrial Fibrillation (ORBIT-AF) registry. Institution: Duke Clinical Research Institute, Duke University Medical Center, Durham, NC, USA. larry.jackson@dm.duke.edu. University Medical Center, 2400 Pratt Street, Suite 7009, Durham, NC, 27705, USA. larry.jackson@dm.duke.edu. USA. USA. USA. USA. PA, USA. PA, USA. Stanford University School of Medicine, Stanford, CA, USA. USA. USA. Journal: J Thromb Thrombolysis. 2018 Nov;46(4):435-439. doi: 10.1007/s11239-018-1715-1. 18: Rhythm control better prevents stroke and mortality than rate control strategies in patients with atrial fibrillation - A nationwide cohort study. Institution: Cardiovascular Center, Taichung Veterans General Hospital, Taichung, Taiwan. ; Cardiovascular Center, Taichung Veterans General Hospital, Taichung, Taiwan; Department of Internal Medicine, Faculty of Medicine, Institute of Clinical Medicine, Cardiovascular Research Center, National Yang-Ming University, School of Medicine, Taipei, Taiwan; Department of Data Science and Big Data Analytics, Providence University, Taichung, Taiwan; Department of Financial Engineering, Providence University, Taichung, Taiwan. Electronic address: ychsieh@vghtc.gov.tw. ; Department of Medical Research, Taichung Veterans General Hospital, Taichung, Taiwan. ; Department of Internal Medicine, Faculty of Medicine, Institute of Clinical Medicine, Cardiovascular Research Center, National Yang-Ming University, School of Medicine, Taipei, Taiwan; Department of Data Science and Big Data Analytics, Providence University, Taichung, Taiwan; Department of Financial Engineering, Providence University, Taichung, Taiwan; Department of Internal Medicine, Taichung Veterans General Hospital, Chiayi Branch, Chiayi, Taiwan. ; Department of Internal Medicine, Faculty of Medicine, Institute of Clinical Medicine, Cardiovascular Research Center, National Yang-Ming University, School of Medicine, Taipei, Taiwan; Division of Cardiology, Department of Medicine, Taipei Veterans General Hospital, Taipei, Taiwan. Journal: Int J Cardiol. 2018 Nov 1;270:154-159. doi: 10.1016/j.ijcard.2018.06.090. Epub 2018 Jun 26. 19: Incidence of thromboembolic events following atrial fibrillation catheter ablation and rate control strategies according to the kind of oral anticoagulation: A systematic review and meta-analysis. Institution: Division of Cardiology, Department of Medical Sciences, Citta della salute e della scienza, University of Turin, Turin, Italy. Electronic address: elisabetta.toso@gmail.com. della scienza, University of Turin, Turin, Italy. della scienza, University of Turin, Turin, Italy. della scienza, University of Turin, Turin, Italy. Electronic address: fabrizio.dascenzo@gmail.com. della scienza, University of Turin, Turin, Italy. Electronic address: fiorenzo.gaita@unito.it. Germany. Germany. USA. Epidemiology, Carmel Medical Center, Haifa, Israel. Journal: Int J Cardiol. 2018 Nov 1;270:172-179. doi: 10.1016/j.ijcard.2018.06.082. Epub 2018 Jun 19. 20: A meta-analysis of randomized controlled trials of uninterrupted periprocedural anticoagulation strategy in patients undergoing atrial fibrillation catheter ablation. Institution: Institute of Pharmaceutical Science, King's College London, UK; King's Thrombosis Centre, Department of Haematological Medicine, King's College Hospital NHS Foundation Trust, UK. Electronic address: yating.zhao@kcl.ac.uk. Journal: Int J Cardiol. 2018 Nov 1;270:167-171. doi: 10.1016/j.ijcard.2018.06.024. Epub 2018 Jun 8.